Cedar Ridge Autumn Woods Condos: Fully remodeled! Second floor coach home in Cedar Ridge at Autumn Woods with beautiful lake views and custom designer finishes throughout. AMAZING location just minutes to shopping, dining, beach access and more. Open concept living featuring high ceilings and gorgeous Spanish porcelain wood look tile. Reconfigured kitchen with expansive breakfast bar, custom Busby cabinetry and stainless steel Jenn-air appliances with adjacent dining area. Sliders open to screened lanai overlooking the water. Three generously sized bedrooms with two full baths. Attached/enclosed one car garage. Wifi controlled thermostat and security system. Autumn Woods is a 24 hour gate-attended community in North Naples, located off Goodlette-Frank Rd. between Pine Ridge Rd. and Vanderbilt Beach Rd. Amenities include 26 acres of lush preserve, two swimming pools, heated spa, tennis courts, basketball court, playground, fitness room and two meeting/activity rooms. Furnishings shown in photos have been removed from the property. Cedar Ridge Autumn Woods Condos: Located in the highly desirable community of Autumn Woods in North Naples on a very quiet cul-de-sac. Immaculately maintained second floor residence with spacious floor plan that features high ceilings, formal dining room, eat in kitchen, large family room, walk in closets and a large soaking tub in the master bath. Enjoy the lake view from your lanai which is accessible from the living room and the master suite. 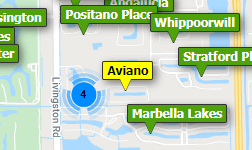 Very close to shopping at Mercato and Waterside shops and just minutes to the beach! A rated school district for elementary, middle and high school with bus pick up inside the development! Great amenities for your enjoyment include a community pool, clubhouse, tennis courts, and more! Cedar Ridge Autumn Woods Condos: Beautiful first floor, 3 bedroom, 2 car garage, end unit with long lake views in the highly desirable and centrally located Autumn Woods community, conveniently located near the back gate of Autumn Woods. Complete with new air conditioner, (<1 year), water heater, stainless steel kitchen appliances and new washer and dryer, this meticulously maintained condo will satisfy the most discerning buyers. Autumn Woods is a 24 hour gated community with exceptional amenities, including 2 community pools, clubhouse with workout facility, tennis/basketball courts, and walking/biking trails. Autumn Woods is located in an A rated school district of Seagate Elementary, Pine Ridge Middle School, and Barron Collier High School. Cedar Ridge Autumn Woods Condos: A totally updated, beautiful condo with a peaceful lake view in the highly desirable Autumn Woods community. You'll enjoy the look and durability of granite in both baths and the kitchen along with extra large ceramic floor tiles in all the rooms, even the lanai. The stairs have been redone with rich hardword and the dining room has grasscloth wainscoting. The walk in shower in the master bath has a lovely frameless glass enclosure while the soaking tub is elegantly lit by a chandelier. Air Conditioner recently replaced. Amenities, Location and Great Schools are only a few reasons that this can be your dream home. Move in ready. About 3 miles to Vanderbilt Beach, 2 miles to Mercato and minutes to downtown, 5th Avenue area. Come see for yourself and make this your home sweet home!